This new report was released in October 2013 by The Gaia Foundation in collaboration with Ecumenical Advocacy Alliance (EAA) and the African Biodiversity Network (ABN). It highlights the need for urgent action to ensure that farmers today and tomorrow can grow resilient nutritious food for us all, in the face of climate change and other challenges. 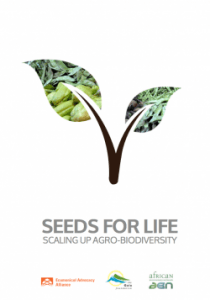 At the core of such action must be strategies to revive the diversity of seed that has been lost from the world’s fiends, and to support the knowledge and diversity that remains. Farmers’ complex farming knowledge, and their right to save, adapt, exchange and sell seed must be recognised and protected in policy and practice. These strategies are critical for us all today – as well as to ensure that the generations to come after us can also farm and eat.